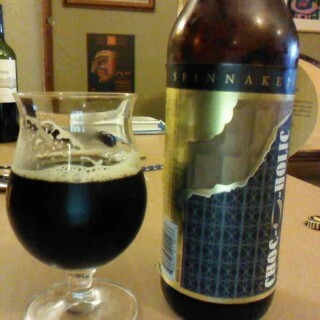 I heard this beer did so well that Spinnakers had to buy some beer back to stock its own off sales. This is believable, it is a darn tasty beer with everyone's favourite ingredient. The trend in Victoria beers is to go after the chocolate porter market. Makes sense, apparently Phillips Longboat porter is the best selling bomber in BC. Campfire mixes well with cool berries to make the nose happy. A roasted astringency starts an enjoyable sip of lagered berries and bittersweet milk chocolate. The mouth feel is medium with an odd cooling sensation. At the end, a dry cocoa dusting leaves a vague nutty finish. The Misses enjoyed it; that is the sign of a good chocolate porter. Very nice.